Here’s a follow-up to my beer recommendations of last week. Guinness used to use the slogan ‘Guinness is good for you’, and now there’s evidence that they might have been right. Actually telling the truth. The old advertising slogan ‘Guinness is good for you’ is actually true it seems. While the manufacturer, no longer makes health claims for the product, scientific research shows a pint of Guinness a day is actually good for your health. Indeed it may work as well as a low dose of aspirin to prevent heart attacks. Researchers at the University of Wisconsin made the discovery recently. The Wisconsin scientists gave Guinness to dogs who had narrowed arteries. 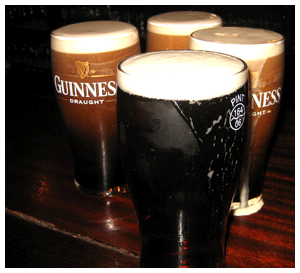 They found the Guinness worked as well as aspirin in preventing clots forming. The researchers told a convention of the American Heart Association in Orlando, Florida, that a pint of Guinness taken at meal time had the best impact. They believe that antioxidant compounds in the Guinness are responsible for the health benefits because they decrease harmful cholesterol gathering on the artery walls.